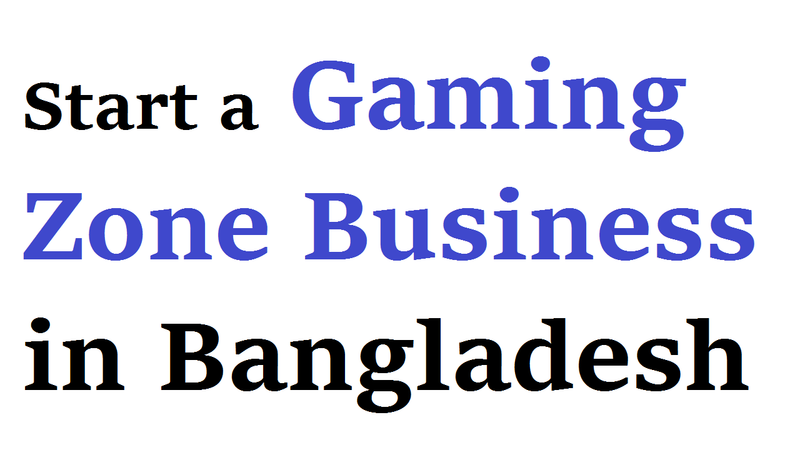 When we’re at the end of 2018, it’s not an innovative idea to start a gaming zone business in Bangladesh. But, it could be a good idea as the people are bored with the same old system games. So, it’s one of the hottest industries is the video gaming zone business. The first and the foremost reason is the game developing companies are coming in front of the customers with better and innovative games and gadgets every day. And it’s like the toppings on your pizza of the latest technologies like Virtual Reality (VR). Also, there is a revolution in the gaming industry with gadgets like virtual reality headsets, motion-sensing game controllers (like cameras, move motion controllers). As the people are going crazy over VR headsets, millions of PlayStation, Xbox consoles are sold every year. The gaming zone business was so popular once upon a time and not far than 20 years in Bangladesh. Hundreds of game shops were found in the various points of the cities, towns and even rural areas. It gets into the low-tide when the internet opens the door of online gaming opportunities. But, the trends are changing and the time is going with high-tide. As a result, gaming zone business in Bangladesh is fast becoming a popular pass-time activity. You can capitalize on this opportunity to launch a small business since most people cannot afford to buy and maintain private gaming consoles at home. Moreover, the best thing about this business is that it does neither need a lot of capital to invest nor a lot of pre-training to get the wheels of the business rolling. If you want to keep up with trends of the gaming zone business is the two most important qualities required in order to conquer the market is the strategic location and ability. And essentially it’s great to point to find out whether there are enough people on your locality that you’re thinking to start the business. Also, you can consider a gaming zone with some random games itself is a profitable business in some places along with an internet café. Moreover, there are more steps to follow while starting a gaming zone. Well, let’s know what the essential steps to follow while starting this business. In the lead, the efficiency and alacrity with which prospects’ needs catering that depend on the success of any enterprise. The majority of your customers would be those who have become bored with their existing collection of games in the gaming zone business. If there are newer gaming launches in your business, customers would visit it to experience the refreshing tingle of nerves. That’s why you need to plan offering a wide and the latest collection of games. Also, this point matters much to get success in your business as there are so many competitors already doing it. Your gaming parlor business plan should factor in all aspects that would increase your business’s credibility, visibility, and popularity to capitalize on the popular pastime of people particularly children and teenagers. These all must include in your business plan. This is a step that either makes or breaks your business. As there are so many in the Dhaka city and its surroundings, you can choose one location where there is much traffic. In this case, you have to perform a deep research for the location. Also, not only a location preferably near an upcoming college/university but try to find out one that’s cheaper as well. But, if you don’t find any cheaper place, you must not let go of it. Although it costs more money, it’ll take more revenue in return. Simply, keep in mind that you can’t select a location without more traffic. This is because traffic is the main fuel for your business success. You need to expand the outreach of your gaming zone business to sustain and remain profitable in the long run. And half of your promotional task is done when you have succeeded in securing a shop in a prime location. Also, start triggering word of mouth promotion while visibility improves credibility. Moreover, you need to offer a wide array of choices under each game category to further transform your customers into evangelists of your services. Besides, you need to organize your ad campaign on proven professional lines to reach out to prospects who are not frequent visitors to the area where your shop is located. And it causes people to commit attention to your venture while distributing pamphlets and flyers. For your gaming zone business, you should have at least a 21” color TV. But, if you plan to start a large business, you need several of them. On the other hand, you need gaming units like consoles, pads among other accessories. Also, you’ll get there two different categories of the gaming units, such as chipped and unchipped. In this concern, chipped one comes with lenses changed to read a wide variety of DVDs. On the other hand, the nonchipped one only works with original DVDs copies. It’s important to clarify the consequences of owning chipped vs. nonchipped gaming equipment while shopping for them. Although market research is nothing really complicated, it’s essential. So, request a few people in your locality to share their expectations with you making a short questionnaire form. It means there is widespread interest in the market if you get an overwhelming response, say “70% YES”. But the market would probably be difficult to survive in and you might want to keep off if you get a 15% acceptance rate. That’s why the market survey is essential to know whether your business will run smoothly or not.